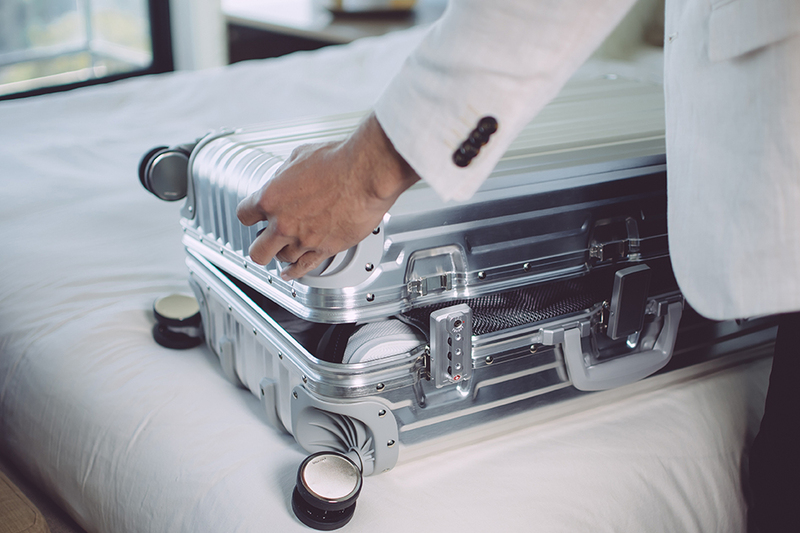 Aluminum luggage is incredibly durable and tough, but it is susceptible to marks, dings, and scratches. To keep your luggage clean and beautiful for years to come, use a soft sponge or washcloth, warm water, and mild household soap. Avoid using cleaning products that contain bleach as well as coarse and abrasive sponges that can damage the finish of your case. Designed for the confident travel tastemaker, this indestructible aluminum carry-on delivers the ultimate in durability, style, and security. The luxurious aluminum case is equipped with premium dual spinner wheels and a telescoping handle with soft grip for superior comfort and maneuverability at every step of your journey. Nestle your travel wardrobe in the shimmering metallic interior, appointed with tie-down straps and a convenient compartment divider. Thanks to a clamp closure system equipped with two Travel Sentry-approved locks, your belongings are safe and secure inside this sophisticated luggage. Clamp closures with two Travel Sentry®-approved locks protect belongings and allow the TSA to screen checked bags faster.